For skin that's gone through the rough, the Pond's Men Energy Charge Face Wash is an effective way to remove grime and impurities off your face. Men generally have tougher facial skin but the Pond's Men Energy Charge face wash is specially designed to removes dirt, dust and oil from your skin to make it look fresh and young. It a gentle wash but eliminates dead skin cells and evens out your skin tone to impart instant fairness. Feel the tingling freshness with its menthol infusion while its coffee bean extracts gently exfoliate your skin. Get rid of tired looking skin and energize it from deep within with Pond's Men Energy Charge Face wash. buy it right away. Pond's Men Energy Charge is created by Pond's the experts in skincare products with energizing coffee extract and cooling menthol is created especially for the modern day man to help his skin be refreshed and brightened always. Post usage of Pond's Energy Charge facewash leaves your skin feeling cool and refreshed. So if you want the perfect face brightening face wash grab your pack of Pond's Energy Charge Facewash today. Recommended to use twice a day (morning and night) for best results. This fairness cream works from inside-out with non-oily , light feel. Inside: Genwhite active absorbs deep to fade away spots & dullness at the source, & anti- oxidant lightening action on dark circles. Outside: discover fairness that glows. Daily anti-spot fairness cream with UVA & UVB sunscreens. 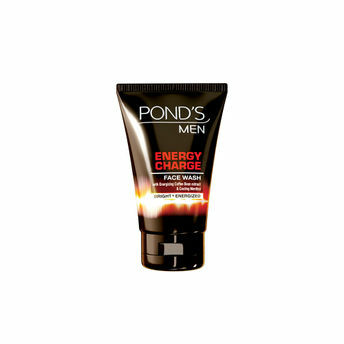 Alternatively, you can also find many more products from the Ponds Men Energy Charge Face Wash range.